Greg Olsen has been an artist for as long as he can remember. Born in 1958, his parents quickly noted his talent and made sure he pursued his passion for art. A teacher in high school cemented his love of art and he went on to study illustration at Utah State University. His body of Biblical works can be found in religious institutions in 20 countries as well as the Pentagon and the headquarters of the NCAA. His many paintings can also be seen in the offices of the Mobil Corporation, Turner Broadcasting, and Westin Hotel. “In His light” is a reproduction of an oil original and demonstrates his passion for religious themes. 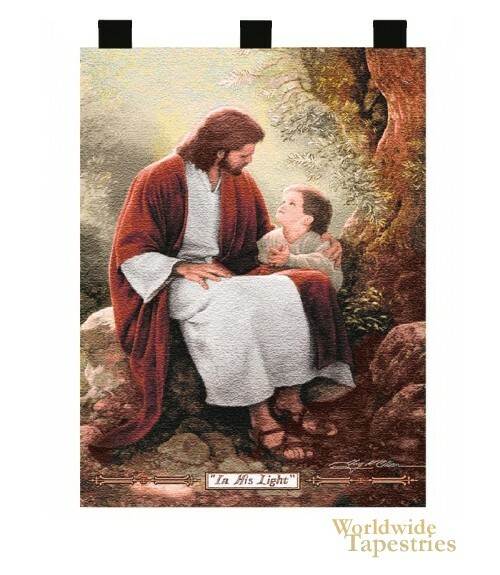 It shows Christ with a small child, which can be seen as a metaphor for Christ himself and the values he espoused to his many followers. This tapestry is lined and has tabs for easy hanging.